Curious Las Vegas visitors may still wonder what happened to the once-sparkling Lucky Dragon, the diminutive Asian-themed casino on the edge of the north Strip at 300 West Sahara Avenue. The operating history was remarkably brief: It opened in December 2016 and almost immediately nosedived toward bankruptcy. Financing, construction and market challenges were many and obvious from the start. 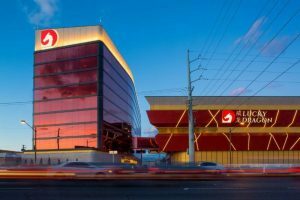 By the time the Lucky Dragon’s doors opened, according to published reports, it had cost $165 million to build – by one informed estimate, nearly 47 percent over its original budget. More than half its cost came from 179 Chinese investors taking advantage of the federal government’s EB-5 Program, which encourages foreign investment in the U.S. and provides a pathway to conditional and even permanent residency and eventual U.S. citizenship. The EB-5 investors lost millions in the Lucky Dragon deal, and 40 of them are trying to do something about it through a lawsuit filed last month in U.S. District Court in Las Vegas. Attorneys Yanxiong Li and Bradley Wibicki represent the Chinese investors. Allegations in the 26-page document claim investors were fraudulently misled by the project’s promoters. Former Las Vegas Sands President William Weidner, real estate developer Andrew Fonfa, and ex-Lucky Dragon chief operating officer David Jacoby are named as defendants along with a series of limited liability companies associated with the hotel-casino deal. Jacoby is also the former manager of the Las Vegas Economic Impact Regional Center, LLC, (LVEIRC) which communicated with the EB-5 investors. Some of the charges leveled in the civil complaint have been previously raised in federal bankruptcy proceedings related to the project’s demise. They include misrepresentation/false promise, constructive fraud, breach of contract, breach of good faith, negligence, unjust enrichment, conversation and other acts. Such accusations are common when an investment deal goes bad, and allegations aren’t proof of wrongdoing. Ironically, while the Lucky Dragon collects dust, many casinos downtown and on Las Vegas Boulevard appear to be bustling. But the plaintiffs in the case clearly don’t believe the problems with the Lucky Dragon were related to the after-effects of the lingering economic recession, or mere bad breaks in a highly competitive gaming market. In other words, no Green Card eligibility, no investment. The defendants are also accused of converting an unsecured $45 million loan from Snow Covered Capital, LLC, in part by using a substantially inflated real estate appraisal for land used as collateral for the “insider” transaction. Other allegations include a “failure to disclose their ownership interests” in real estate parcels associated with the development; controlling both the buyer and seller of the property; requiring the investors to use only immigration attorneys approved by the developers and LVEIRC; and misrepresenting the $22 million investment as a “contribution” by LVEIRC. The lawsuit paints a harsh picture of deception and unkept promises. Among them: that the project would be funded exclusively through EB-5 investment; that the land on which the casino was built was worth more than $30 million, and that the investors were entitled to full $500,000 refunds and a 10 percent processing fee if they were denied a Green Card. “At the time of making these representations and/or promises, Defendants knew or believed the statements to be false,” the lawsuit states in what sounds like the opening salvo of a potentially long and bruising battle. Given the accusations of deception flying in the lawsuit, those associated with the Lucky Dragon may be fortunate to walk away with their reputations intact.